Carolina Hurricanes' Jiri Tlusty (19), of the Czech Republic, is blocked by Islanders goalie Kevin Poulin during the third period of an NHL hockey game in Thursday. Justin Peters wants the Carolina Hurricanes to believe in him. They say they do — especially after performances like this. 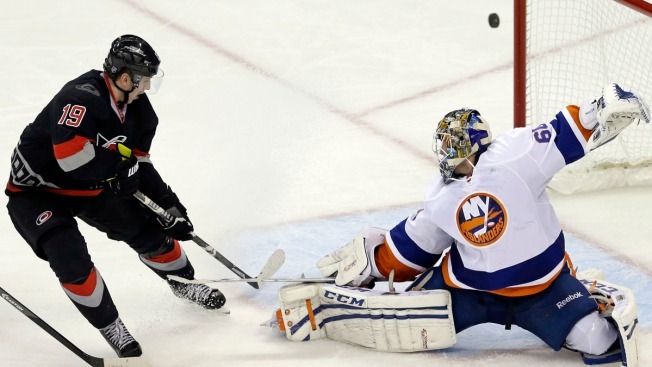 Peters stopped 21 shots in his third career shutout and the Hurricanes beat the Islanders 1-0 on Thursday night. Radek Dvorak scored a deflected goal in the first period to help the Hurricanes win their second straight following a five-game slide that coincided with a lower-body injury to starting goalie Cam Ward. Peters has allowed a total of one goal in those victories. "He's given us an opportunity to win these last two games," coach Kirk Muller said. "He's done his job. We'd like to say we're going to score more than one or two goals, but you know what, there's nights you don't have to. He's given us a confidence that we can just go out and play our game ... and play it the way we want to play it." Peters, making his sixth straight start, made one of his best saves in the final minute of the second period when he stopped a streaking Michael Grabner after a turnover. The Hurricanes blocked 13 shots, three by forward Tuomo Ruutu. Peters finished with the Hurricanes' first shutout of the season and his first since blanking Washington last March 12. "I want to create confidence in the team. I have confidence in them, and I'm just trying to build that confidence," Peters said. "Every day, we become more confident in each other because we trust each other, because we're playing the right way. When we play the right way ... that's when we get rewarded." All six of Carolina's wins have come by one goal. "Games are tight and there's not a lot of room out there," Muller said. "We found a way to win." Backup Kevin Poulin made 23 saves in his second start in six days for the Islanders. They have lost two straight and four of six, and were shut out for the first time this season. "It's frustrating to sit here and not even get a point in that game when I felt we deserved a little better," coach Jack Capuano said, "but that's the way it goes." At the very least, their penalty-kill unit showed improvement. They shut down both of Carolina's power plays after giving up four goals with the man disadvantage in a 6-2 loss to the Capitals two nights earlier. The Hurricanes, who have made a habit of falling behind early, scored the first goal of a game for the first time since mid-October — and needed a deflection to do it. "It was a little almost unusual we got that first one," forward Jordan Staal said. Poulin tried to clear the puck from behind the net but Ron Hainsey kept it in at the blue line, then threw it at the net and Dvorak tipped it in from the side of the net at 6:39. What turned out to be the game's only goal also marked Carolina's first in a 5-on-5 situation since Oct. 25. In the four games in between, they scored four goals — two on the power play, one with a sixth attacker and one in a 4-on-4 overtime to beat Philadelphia two nights earlier. Meanwhile, the Islanders gave themselves plenty of scoring chances but too few pucks on net: New York put just 12 shots on goal during the first two periods. "We gave him an opportunity to make that first save, and our 'D' did a good job of blocking people out in front of the net and preventing those second and third rebounds," Muller said. Added Capuano: "Missed too many shots."